Note: You can click on the pictures for higher resolution images. 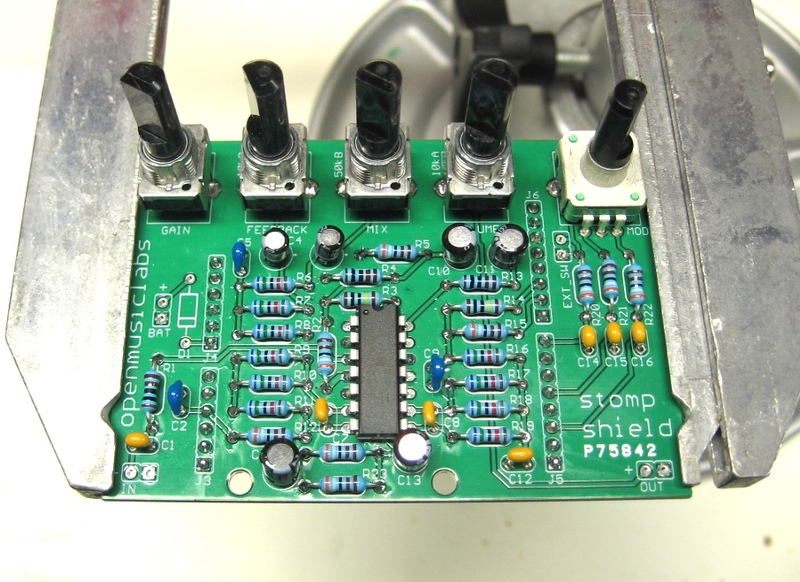 To assemble your Stomp Shield, you will need a pair of cutters, soldering iron, and solder. 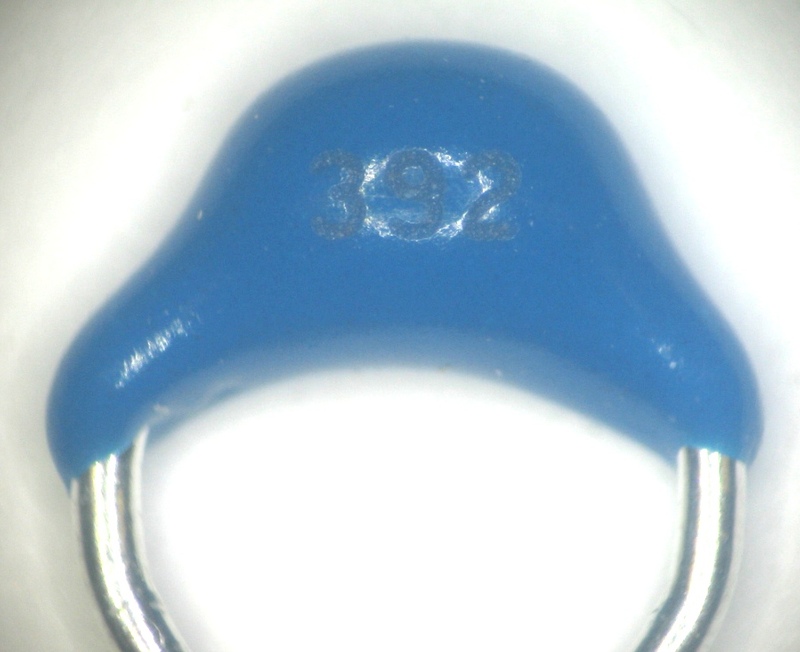 Good lighting and a magnifying glass will also come in handy for identifying capacitors. 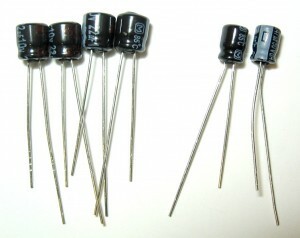 A full bill of materials (BOM) can be found the wiki (here). 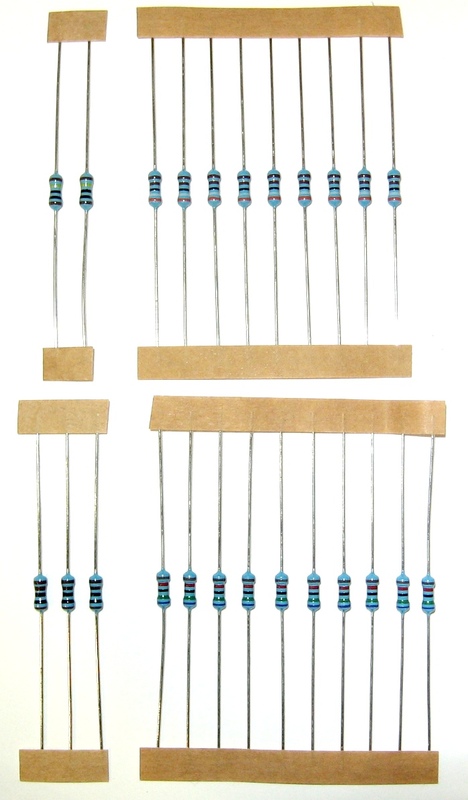 Make sure you received all of the parts. If anything seems amiss, notify Open Music Labs immediately. The BOM also shows which parts go where, so it is handy to have around while building. 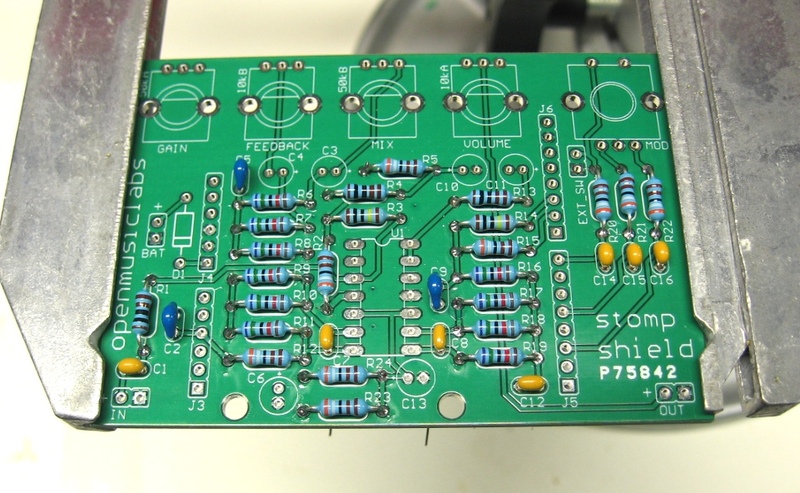 After placing the resistors in the board, and soldering them, cut the remaing ends off. 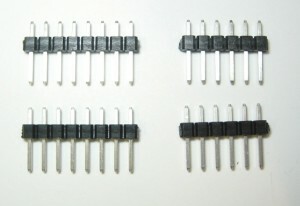 Again, solder them in place, and clip the leads. 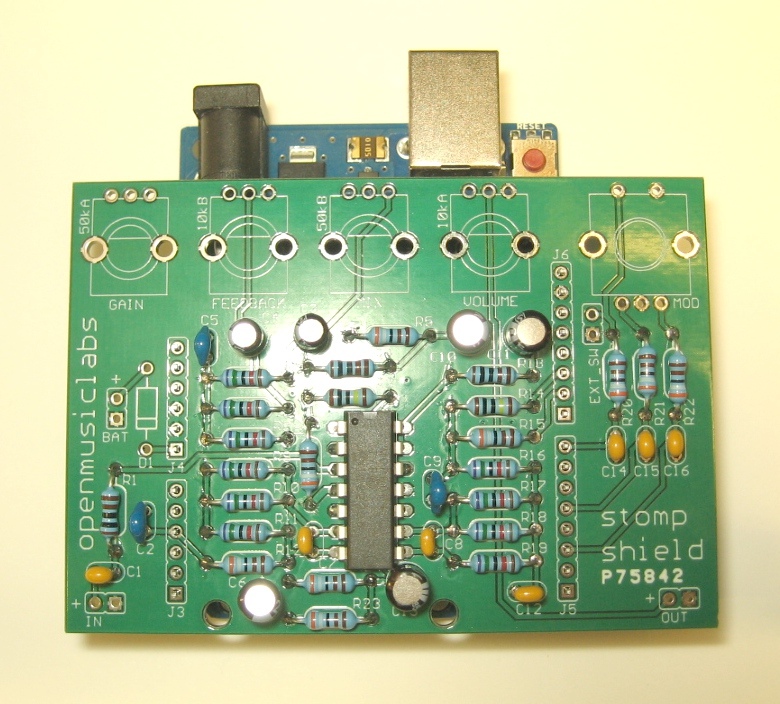 If you are planning on putting your Stomp Shield into a case, be sure the electrolytic capacitors are flat on the board. If they stick up too high, you might not be able to fit the shield into a case. 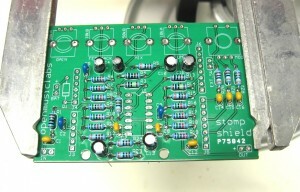 The op-amp has a small notch at the top, be sure this aligns with the notch on the op-amp outline on the board. 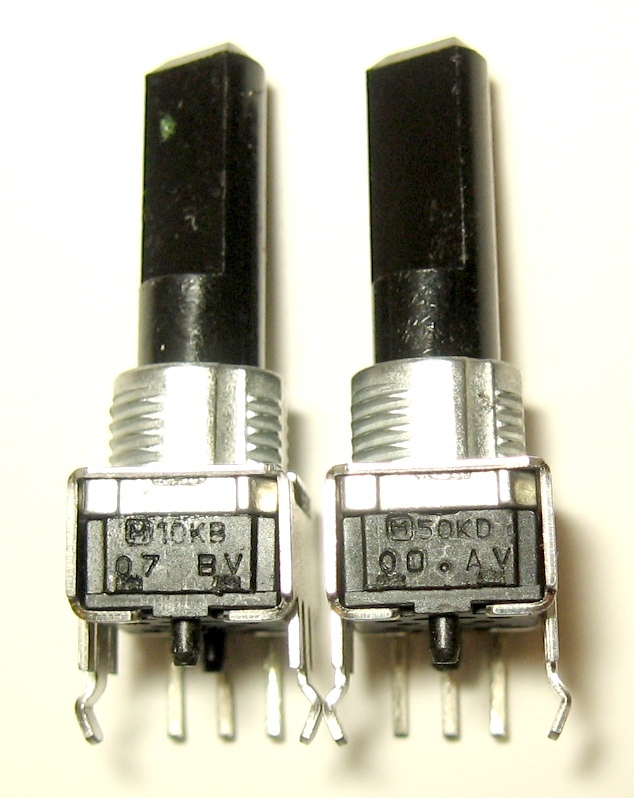 It is often a good idea to use a socket for ICs, just in case they fail, or if you want to swap them out for sound reasons. If you have a socket, feel free to use it, but be forwarned that it might not fit into a case with a socket. 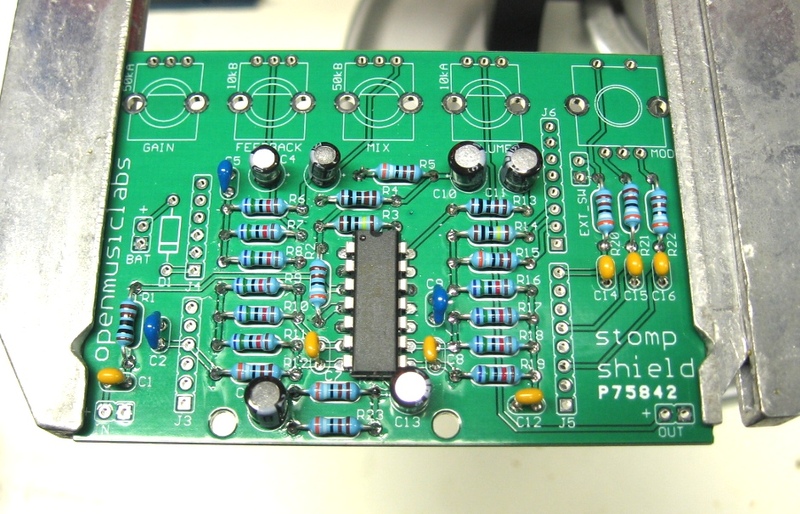 A good way to get the pins aligned properly, is to place them into an Arduino, and then place the shield on top of the pins. 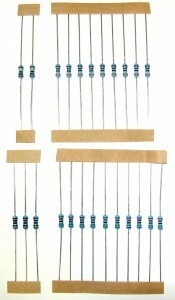 That way they are are perfectly matched to your Arduino. You can solder them while they are set up this way. 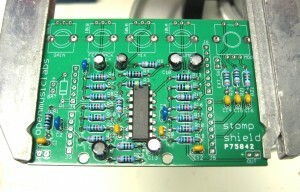 If you are going to be putting your Stomp Shield in a case, now is the time to think about knob hieght! 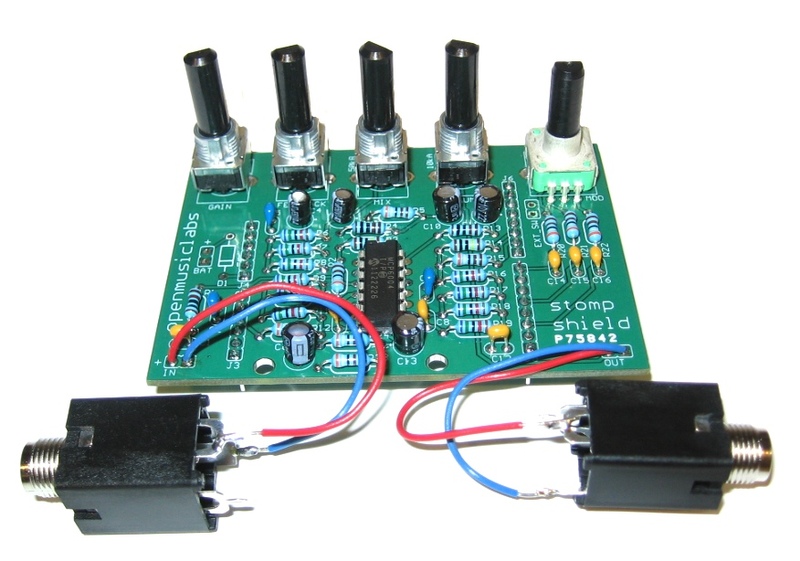 Test out the knobs, pots, rotary encoder, and case, to see how they all fit. The pot shafts are a bit long, and might need to be cut down. 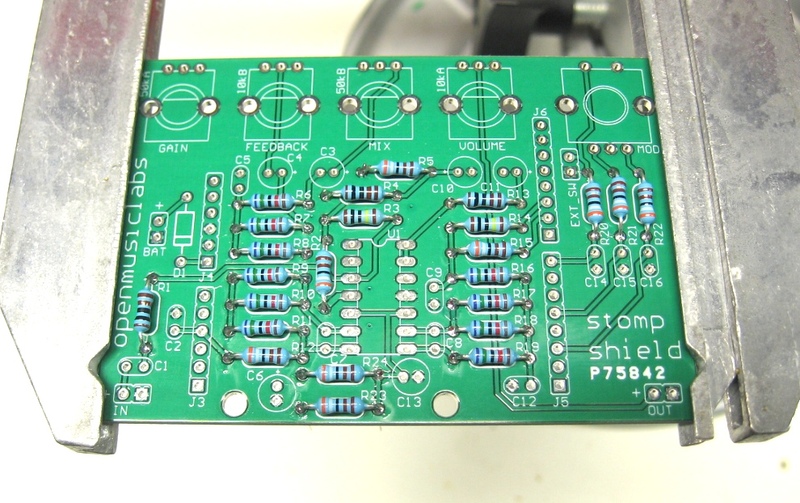 If you decide to do this, you will want cut them before you solder them to the board. 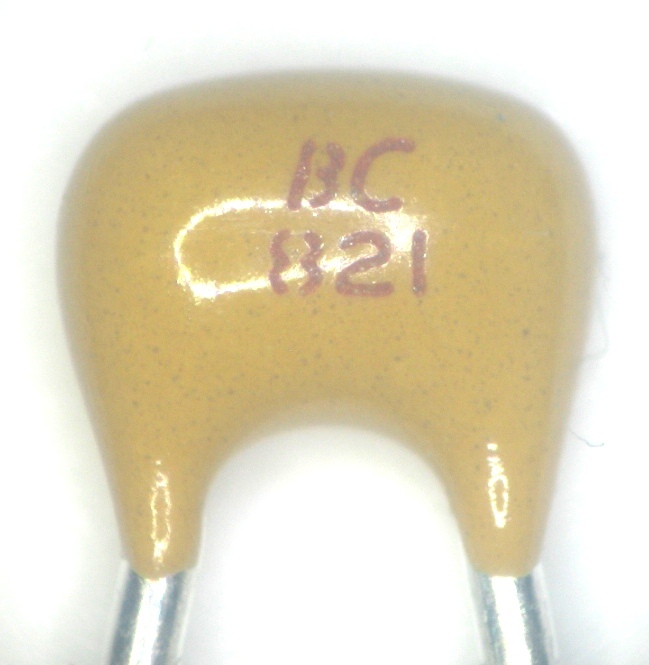 The best way to do this, is to grip the pot shaft (not the base) with a small pair of pliers, and either use a sharp pair of diagonal cutters and clip them to length, or use a small saw or dremel, and cut them to length. Gripping the shaft is important, as it minimizes the stresses on the pot itself while cutting. 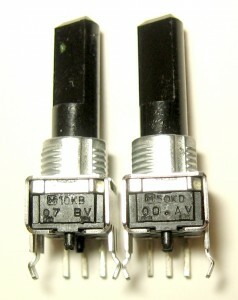 The one at the left says “10kB”, and the one on the right says “50kD”. There should be 1 each of 10kB, 10kD, 50kB, 50kD. The board is labeled with these values, except 50kD and 10kD are labeled as 50kA and 10kA (the more standard labeling for log pots). So just put the D’s where the A’s are shown. Be sure to snap the pots down firmly, so they are fully seated. 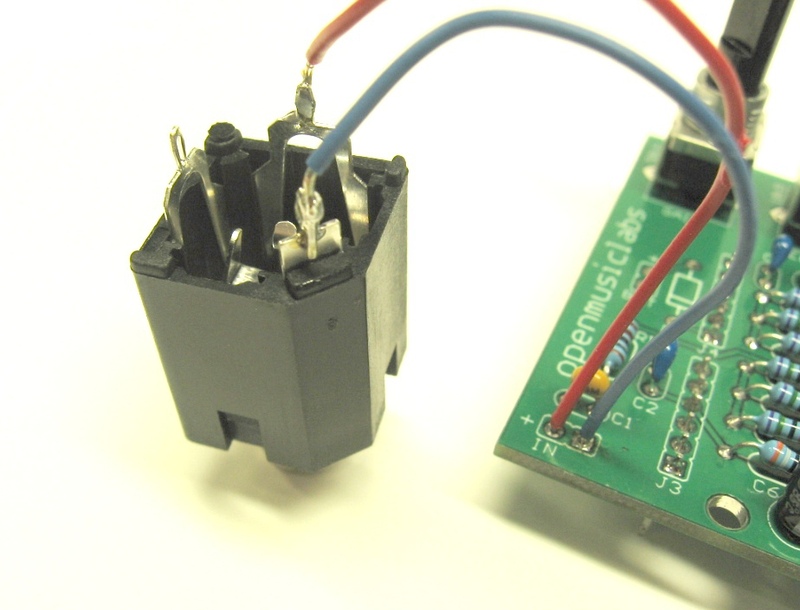 We have a good tutorial on soldering pots on the MICrODEC assembly page, along with a video! There are actually a bunch of good soldering tips on that page, so its worth a read even if you don’t have a MICrODEC. The last thing to do is put on the 1/4″ jacks. 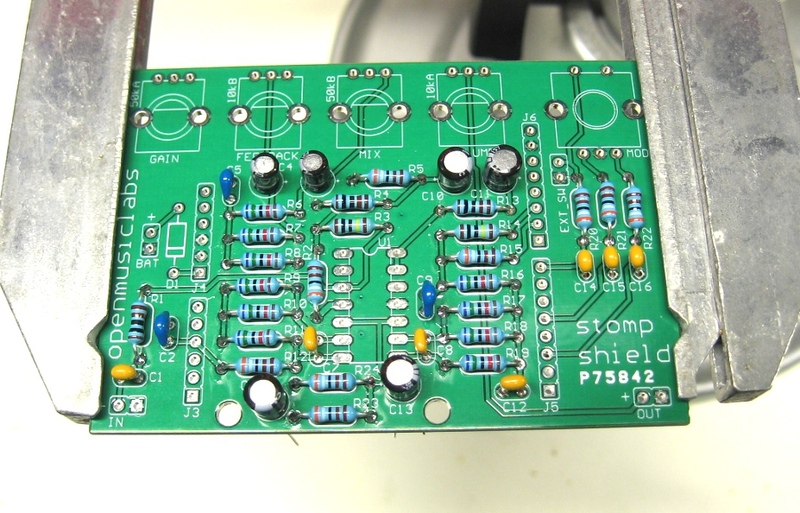 We opted to not use board-mounted jacks, as those don’t fit into cases all that easily. There are headers for IN and OUT. 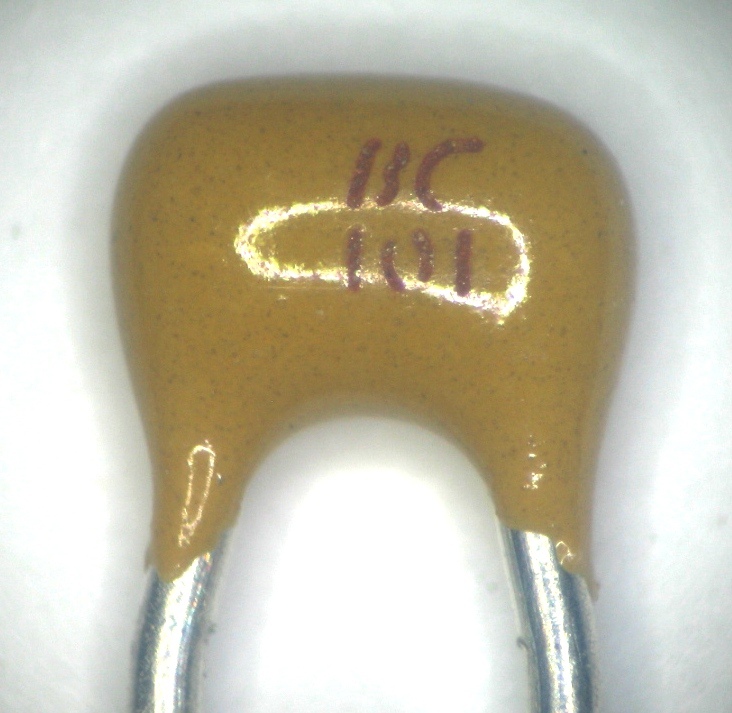 There is a (+) symbol on one side of these headers, and this goes to the tip of the 1/4″ jack, whereas the other side goes to the ring. 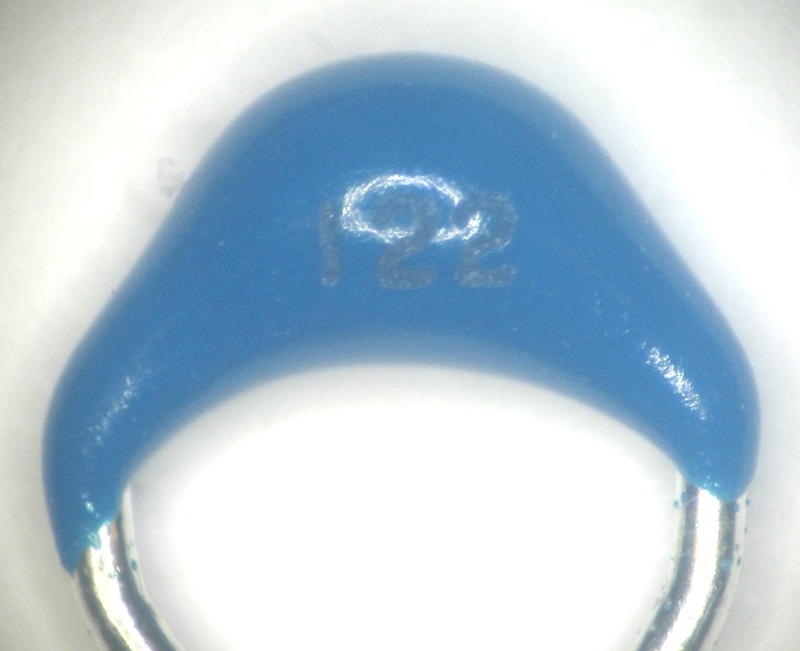 You can identify which pin on the jack to solder to by the indented corner on one of the sides. This flatted corner (facing you in the above image) is the ground connection. 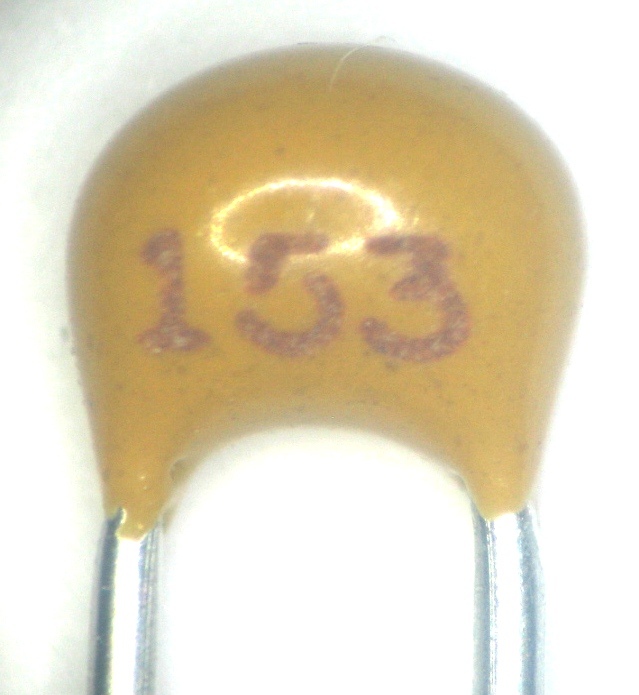 The pin to its right is the positive connection. 9. You are done – Rock out!